Netfind.com shows up on users’ web browsers if a certain browser hijacker promoting this website enters their computers. Despite the fact that browser hijackers are distributed using deceptive methods and usually enter computers completely illegally, it will take a second to find out if the browser hijacker has really affected your system. The first symptom showing that the browser hijacker has entered your system successfully is a new website Netfind.com set as a homepage, a default search tool, or New Tab without your permission. It might seem that this website is a legitimate search provider, but you should know that it is not. It is just a page pretending to be decent so that users would not erase it from their browsers. We see no reasons you should not delete Netfind.com, so we highly recommend that you go to erase it from your browsers today. If you do not do anything to remove Netfind.com from your web browsers soon and use every day this search tool for performing web searches, you will be presented with tons of commercial advertisements. These advertisements might not differ much from normal search results, but they exist, we can assure you. You will sooner or later discover them yourself because you will notice that certain search results you click on redirect you to pages with no information you are looking for. Redirections to third-party pages is one of the main reasons you should not use Netfind.com as your default search tool. If you keep using it, you might be taken one day to an untrustworthy page promoting malicious applications. You might also be asked to provide personal information to participate in, for example, some kind of fictitious lottery on these pages. We do not want you to experience problems, so we highly recommend that you go to uninstall Netfind.com from all your web browsers. The quicker you go to eliminate it, the better because you cannot know when problems will arise. How did the Netfind.com browser hijacker enter my computer? If you have not changed your browsers’ settings, it is very likely that a browser hijacker has illegally entered your system and applied changes to your browsers without permission. These infections usually travel next to other applications in bundles, but they might find another secret way to enter computers unnoticed too. It is not the most important thing why you see Netfind.com set now because you still need to implement the Netfind.com removal as soon as possible. The next paragraph should help you do this. How do I remove Netfind.com? 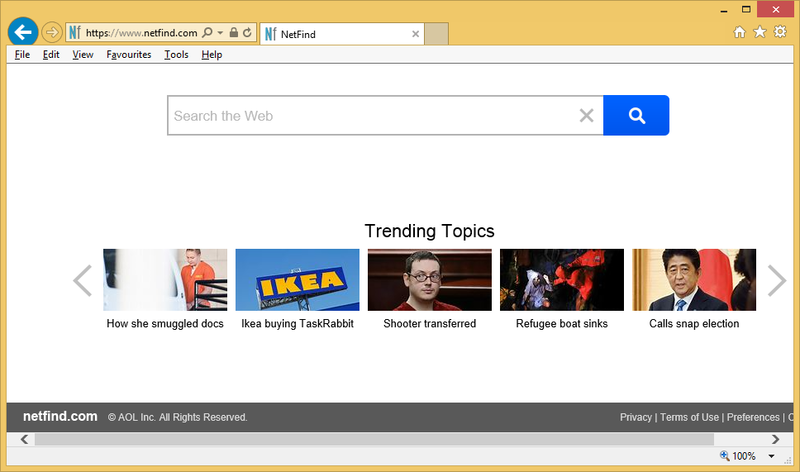 Go to implement the Netfind.com removal as soon as possible even if it seems at first glance that it is quite a trustworthy search tool. You can remove Netfind.com either manually or automatically. Both methods are good, but we should emphasize that the manual method is more suitable for more experienced users. If you are far from an experienced user, delete Netfind.com automatically. You need to have a powerful scanner to delete malware from your computer in an automated way, so if such a tool is not installed on your system yet, download and install it first.